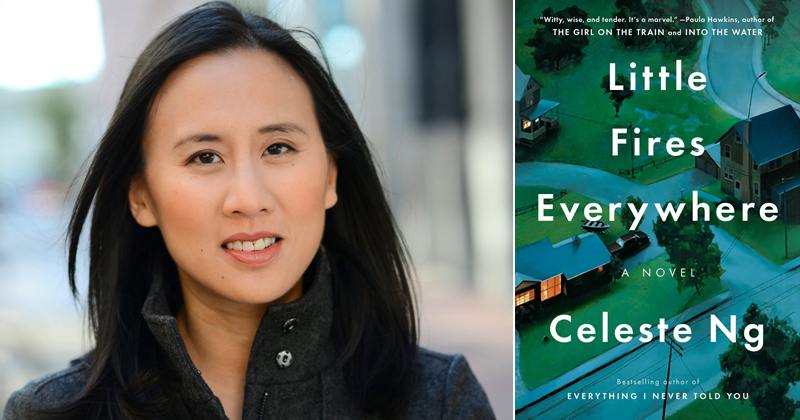 Brazos Bookstore presents Celeste Ng, reading from her book Little Fires Everywhere. Q&A and signing to follow. This event will take place on Tuesday, May 21 at St. Paul’s United Methodist Church. This is a ticketed event. Doors open at 6:30 pm, and the event starts at 7 pm. From the bestselling author of Everything I Never Told You, a riveting novel that traces the intertwined fates of the picture-perfect Richardson family and the enigmatic mother and daughter who upend their lives. When old family friends of the Richardsons attempt to adopt a Chinese-American baby, a custody battle erupts that dramatically divides the town—and puts Mia and Elena on opposing sides. Suspicious of Mia and her motives, Elena is determined to uncover the secrets in Mia’s past. But her obsession will come at unexpected and devastating costs. Tickets admit one individual, cost $17, and include a paperback copy of Little Fires Everywhere. Tickets are nonreturnable. For more information, please contact the Brazos Bookstore at 713-523-0701.